• List of seamen serving on ships belonging to the Commissioners of the Northern Lights - as at 1810 - for impressment exemption passes during the on-going wars with France! The sea captains are not listed! • An extract from Robert Southey's "Journal of a Tour of Scotland in 1819"
• Robert Stevenson's letters to Edinburgh printers in preparation for the publication of his book "Account of the Bell Rock Light-house" of 1824. • Stevenson's views on keeping pigs on the Isle of May. • Two letters by Stevenson in preparation for his journey with Walter Scott, Esq, and the Commissioners in 1814. • Elizabeth Paris asking for remuneration after looking after Michael Wishart for 4 months! No. of men - 32; average age - 27.7 years; average height - 5 ft 6¾; complexions - fair, 10; brown, 11; black, 5; sallow, 2. "Journal of a Tour in Scotland in 1819"
"The Inchcape or Bell Rock Light House (on Sir Ralph the Rover's rock) is visible from the town, two revolving lights, one very bright, the other less so, being red; they are about three minutes in revolving. The town is very neat and apparently very flourishing; the streets flagged, which they are not at Dundee to the disgrace of that city, where they have good quarries close at hand. Several booksellers' shops, which indeed seem to be much more numerous in Scotch than in English towns and here at Arbroath I saw more prostitutes walking the streets than would I think have been seen in any English town of no greater extent or population." 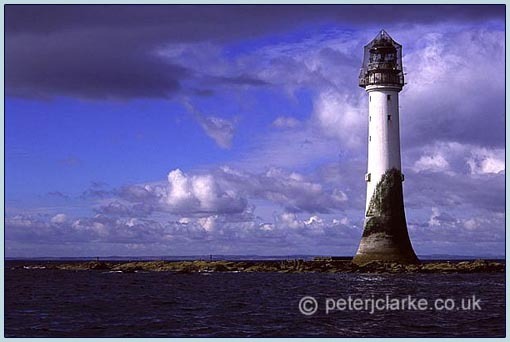 "Having completed my book upon the Bell Rock Lighthouse - I now wish to dispose of the Impression to a Publisher - and make you the first offer in Edinburgh. Will you therefore be so good as to call here and see the proof volume anytime between 10 and 3 o'clock tomorrow. "The edition extends to 300 copies - but of these Lighthouse Board reserves 50 for making presents of - and therefore there will not be above 240 copies to dispose of. This is but a small edition and it is not wished that the work should sell at more than 4 Guineas. It extends to upwards of 500 pages and has 23 plates, the size is larger than Quarto and it costs upwards of three Guineas per volume." "I have now got the complete of my book upon the Bell Rock wanting only the publishers name. Will you do me the favour to come and see it anytime before 3 or after 7 this evening, or tomorrow morning and give me an offer for the remaining part of the impression - which extends to about 240 copies. "The whole extends to about 300 copies but of these the Lighthouse Board retains 50 for the immediate use of the Board - and about 10 copies go to the public libraries. The price proposed is 4 Guineas for which it should sell." According to MeasuringWorth.com using the Retail Price Index, 4 guineas (£4 4s, or £4 20p in today's money) would translate in 2008 to about £306! Not for the faint-hearted! - Ed. [In a letter to John Peters dated 18 Mar 1816 re the keeping of animals on the Island [of May], Stevenson says "you will observe that Swine are rather an objectionable Animal to keep about a Lighthouse but if kept they must be confined and on no account be allowed to roam about the doors or suffered to go at large on the Island"]. Whether or not Stevenson had concerns as to the breeding population of birds is not recorded! - Ed. 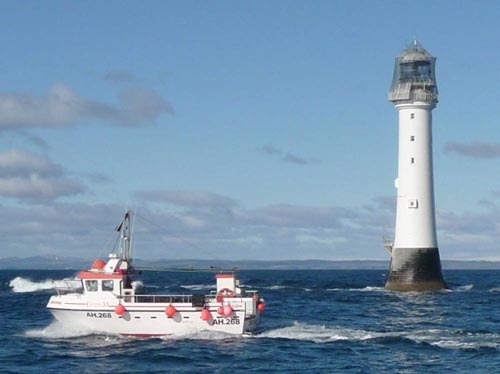 I don't think I've ever seen an image of the Lighthouse Yacht which Walter Scott sailed on in 1814, but it would have been a lot larger than the Oriane, adding a splash of colour at the lighthouse. The two letters below come from Stevenson on the brink of his momentous voyage in 1814 with Walter Scott, Esq. and the Commissioners of Northern Lights. The anticipation is obvious and his mood buoyant (if not anxious) to say the least. Both were written a good 6 weeks before the cruise was due. In the first letter to John Peters, Stevenson goes on at great length on the virtues of good housekeeping. The letter to Capt. Taylor, who had been given the task of deputising for him on the usual annual tour of lighthouses, underlines the need to ensure the safety of the vessel! Stevenson was anxious that nothing would go wrong for his important adventure at the end of July. Note, too, that Capt Taylor was to return via the Forth and Clyde Canal. Widewall Bay is in the Orkneys. "I hope you are paying the necessary attention to the entire cleanliness of the Forecastle and Storerooms insofar as regards the duty of the cook and that the Cabins and all their apartments are kept in the most elegant and cleanly condition insofar as regards your own duty with the assistance of the Steward's boy. "Take notice that that state of universal cleanliness ought not to be overlooked although they may be no ceremonious company on board. If you allow your duty to be flinched from in any case in vain will you think of getting things in order when it is demanded of you and your assistants. When there are no passengers in the Forecabin you should be still more attentive and in good order in the Aftercabin to keep yourself and assistants in the habit of working and ordering the various matters. See that there be no mousewebs, no portions of dust moistened into dirt lying in any of the corners, no towels that smell with grease, nor tablecloths of course in use from week to week - but be always orderly and clean both at bed and board - and see that the orders regarding the airing of the bedding is strictly attended to and on no pretence whatever allowed to be neglected". "I hope you find things in your new Ship pretty much to your mind - I am am sorry to observe from the state of the weather that you are likely to have somewhat rough weather but it will put you in mind of the Days of Youre - and at the same time make you enjoy the delightful repose of a smooth water Frith when it comes again in your way. Michael Wishart met with a serious accident on the 30th June 1809. He was off work for 58 weeks. During that time he was cared for by Elizabeth Paris. In this letter to Robert Stevenson she asks for payment . . . which, I'm pleased to say, she eventually received! "I understand that you have heard from Mr Duncan that I have got no settlement for Washing and Attendance for Michael Wishart which you know was a great deal more than ordinary, and all that recieved was board and lodgings, and I think the lowest charge that I can make is a sixpence [2½p in today's money] a day for 4 months which I hope you will take to a consideration.